Earlier this summer, Solutions Marketing Group (SMG) unveiled a new look for its branding and website. And with the new look comes new videos! I am excited to share with you a brand new About SMG video, in which I share why I established SMG and why disability inclusion presents a business opportunity for every organization. There are 56 million people with disabilities with disposable income of $544 billion in the US. This is the country’s largest, most overlooked market, and there’s vast opportunity to reach them as consumers and employees. The companies that have gotten to them first have built lifelong relationships with consumers yielding increased sales, loyal employees, and have built affinity with the general market. In spite of the opportunity, there are very few organizations that understand how to reach the disability market as customers, guests and employees. What eludes them is that they don’t understand how to effectively understand, penetrate and retain the market. That they’re leaving money on the table by not building a relationship with the market. My team and I remove the barriers and bottlenecks that keep organizations from reaching people with disabilities as customers and employees. We help clients understand what drives the market to take action, by creating strategies and services to support it. We help them build a bridge to the disability market and provide them with insights and tools to build a relationship with consumers and prospective employees with disabilities in a real and authentic way. Get in touch if you would like to learn more! Before Caroline’s Carts, a trip to the grocery store or a quick dash to pick up household or clothing items could be a logistical nightmare for families with a special needs child or an adult family member who cannot be left alone. By making it possible for these families to enjoy one more bit of normalcy in their lives, Drew Ann Long, inventor of Caroline’s Cart and the mother of a child with Rett Syndrome, has now changed the dynamic of that everyday experience. How and Why Did Target Adopt These Carts? Long notes that the first cart shipment, delivered to a local mom and pop grocery store, came on October 9, 2012 – Caroline’s birthday. The initial enthusiastic feedback from the store owners proved that Caroline’s Carts were an effective, pragmatic answer to a widespread challenge. Buoyed by this success, Long approached Technibilt, one of the nation’s largest grocery cart manufacturers. To generate interest in Caroline’s Cart throughout communities and around the country, Long met with local disability organizations while Technibilt spread the word among its client list. In fact, as Little notes, “Several groups have contacted us to endorse the cart. The largest group was Easter Seals. We were the very first product to bear the Easter Seal Logo. Caroline’s Carts also received the da Vinci Awards®, a prestigious, international forum celebrating the most innovative developments and research in all fields of assistive and adaptive technology. The ultimate goal of any business is economic viability. Technibilt’s Little says, “We knew Caroline’s Cart would sell. We knew if we built it and enlisted Drew Ann Long to help us market the cart, it would be a success, that Caroline’s Cart was going to be an award winning product.” She points out that the carts are also helpful for people with family members who other conditions that do not allow them to simply walk alongside another shopper and who also cannot operate the motorized carts. Caroline’s Carts can be found in every state except Hawaii at Kroger, Publix, Hannaford, Food Lion, Whole Foods, Wegman’s and more. Having already expanded to Canada, Technibilt anticipates also debuting the product in Germany, Russia, Egypt, Spain, the United Kingdom and Australia. www.carolinescart.com offers a list of store locations where the carts are currently available. 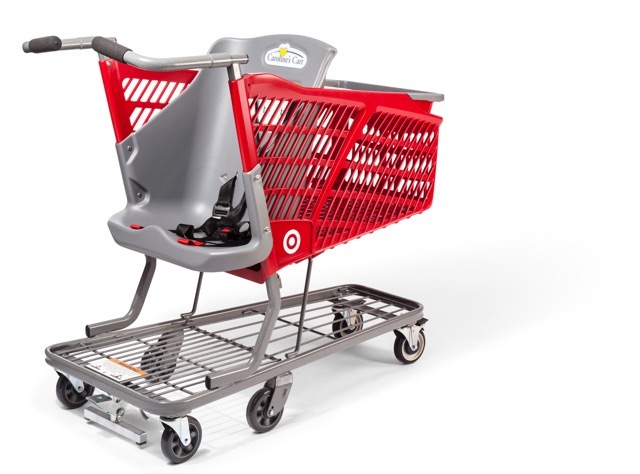 With the excitement of this product expansion, it is important to note that not all companies who provide the carts have them in all of their stores. The Cart’s Facebook page is a great place to follow the progress of this dynamic invention as it continues to impact the world of inclusion. This page is also be a resource for families seeking to build advocacy networks, encouraging an even wider range of stores to make the Cart available. Target’s collaboration with Technibilt marks significant progress in the work toward full inclusion. As part of its overall commitment to providing a positive shopping experience for all of its guests, Target has created a high visibility opportunity for families to participate more fully in the everyday tasks that make their lives work. As Target reminds us, however, the real heroes in this story are the everyday consumers, like Drew Ann and Caroline. Not only the Carts, but also the people who are out and about using them, hint at an exciting new normal for all of us.